I am going to take some credit for the existence of this root beer. I know it sounds presumptuous, but that could be said for most of this website. You see, after I reviewed the Ginseng Up Private Label, I sent them an email congratulating them on the Seal of Approval. I also mentioned that it was strange that their Ginseng UP brand line didn’t have a root beer, especially since their tagline is “The Root of All Power” which could be a double entendre with root beer, and hoped that they’d make something equally good with ginseng. As you can see, they make one now, but it’s different from the Private Label in more than just added ginseng. This is all natural with cane sugar and no preservatives, which makes people like my lovely wife very happy. The Body is sweet and full and creamy with a pronounced ginseng flavor and notes of caramel and a hint of wintergreen. The Bite is nice with clove the dominant spice though it finishes smooth. The Head is tall with decent staying power, not the best by any means, but nice. The Aftertaste is vanilla with a little ginseng. Yum. They’ve made a nice creamy root beer with some additional complexity from the wintergreen and cloves. They make the ginseng work perfectly with it too, adding a nifty little twist without detracting in the least. I expected nothing less from the shadowy root beer overlords of the private label industry. Predictably, this is also sold in different bottles with different labels with the American Classics more prevalent. But it’s the same recipe. See how it rates against other root beers. It’s that time of year when the Super Bowl comes upon us. The biggest TV event in the US and massive celebrations shall ensue. Being from the Seattle area, this is especially exciting to see the Seahawks return as defending champions. There are many wacky ways that have been used to predict the winner, from rabbits, puppys, porcupines, search engines, and video game simulations. These are of course all rubbish. The most accurate predictor is one that I’ve known for years but only now make public. It is the Root Beer Bowl Predictor. Look at the three best bottled root beers from the respective teams’ larger home zone, Seattle area for the Seahawks, all of Massachusetts for the Patriots, and see the combined ratings. The keg difference in the rating multiplied by touchdowns gives the spread. The best root beer will win. Every time. Without question. Seriously. So let’s get on to the teams. The team “captain” in this case is the highest rated brew from the city proper. 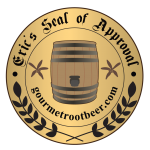 For Seattle this is the Seal of Approval rated Jones Root Beer coming in at the lowest 4 kegs. The rest of the Seahawks’ root beer team comes from a 20 minute drive to the north in Mukilteo, WA, where Orca beverages makes the near peerless Bulldog Root Beer and the solid Brownie Caramel Cream Root Beer. This gives a team rating of 12.5 with nothing but Seal of Approval brews. For the Patriots the captain is Emack & Bolio’s Rock It Root Beer. Very delicious but a poor Head relegates it to a mere 3.5. The rest Patriots’ Root Beer team line up comes from from Worcester, MA. The first is Polar Classics Root Beer with a respectable 3.5. Their final member is a sleeper, Ginseng UP, but not the Ginseng UP name brand root beer (which I haven’t reviewed yet), but their default private label recipe that they supply to the world’s private labelers. A Seal of Approval brew at 4 kegs. Then the Patriots’ final lineup gives them 11. 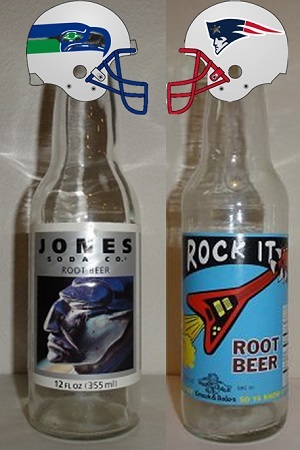 Prediction: Though the Patriots have a strong root beer lineup, it isn’t enough to overcome Seattle’s all-star lineup. I see the Seahawks winning this by 10 points. GO SEAHAWKS!!! My esteemed coworker, Jimmy Jeff got this down in Texas at a Carl’s BBQ Restaurant where it’s labeled as Carl’s BBQ Old Fashioned Root Beer. However, it’s really a custom recipe by Teeroo’s Private Label that’s bottled by Ginseng Up. The Teeroo’s recipe was originally developed by some private labeler in Florida who the owner of Teeroo’s worked for as a distributor. Eventually the Florida dude gave it up, probably to retire in New York, and Ginseng Up told all of the other distributors that they could operate independently and continued to supply the recipe, which is different than the Ginseng Up recipe. As Teeroo’s labels for lots of small businesses in Texas, I’d expect there to be numerous different labels. The trick to identifying it is to look for the small print that lists Teeroo’s as the distributor. Unfortunately, there is a very real possibility of other private labelers in other states, with no affiliation to Teeroo’s, to be using this recipe as well. I have no doubt that Dr. Percival C. McGillicuddy will need to solve that case sometime in the future. The Body is sweet with a caramel sassafras flavor accented by vanilla. The Bite is ok, sharp carbonation with a little spice, but I’d prefer it more reversed. The Head is a good height but fizzes away very rapidly. The Aftertaste is some nice vanilla but it doesn’t really last very long. So this is pretty much a generic creamy root beer. It’s not bad, but nothing special. I’m sure it would go well with BBQ ribs and whatever else is served at all the other places that have it labeled as their own. See how it rates against other root beers.